Girl Scouts’ Anna Maria Chávez spoke to The Alumni Society about at the 2016 Leadership Summit in New York City. NEW YORK CITY—Together we can do what alone we cannot. That theme resonated loudly with members of the Society as they listened to keynote speaker Anna Maria Chávez. Chávez  is the chief executive officer of Girl Scouts of the USA and was the keynote speaker for The Alumni Society’s second annual leadership summit in New York City. After a morning of breakout sessions and networking, Alumni Society members enjoyed a keynote lunch presented by Facebook. “This is an amazing group of people. Bonus: we’re all Latino!” The crowd cheered as Chávez opened her talk. Chávez spoke about the challenges that face Girl Scouts, the largest leadership organization for girls in the world. “The messages that girls are hearing are not positive, and they’re not positive for people of color,” she says. Chávez herself was a Girl Scout, and she says the organization helped her realize her potential as a young girl in a rural area. Chávez’s father did not have an education, but he spent his life ensuring that his children would receive higher education. Chávez went to Yale University, and her brother attended Columbia University. “Every one of us here is here because someone made that sacrifice for us,” she says. When Chávez speaks to Girl Scouts around the country, many ask her what they can do as young women to give back to their communities. “Do something you’re passionate about,” she says. “But do something every day that scares you just a little. Fail and fail spectacularly, because if you don’t fail, you’re not innovating.” What this country needs, she says, is more innovators. Chávez told the Society that she is leaving Girl Scouts, after eight years, because she wants to do more work to “move the dial” for Latinos in American society. “It’s time for me to follow my own advice. I’m jumping off the ledge. I don’t know where I’m going to land, but I’m jumping,” she says, and the audience gave her a standing ovation. Heather Conneely, US Business Lead at Facebook, was the master of ceremonies and introduced guests to Chávez. She live-streamed the event on Facebook. “My friend, Eliana Murillo of Google, emceed last year. And since she took a selfie, I had to one-up her,” she says to laughter and greetings called out to Murillo. Conneely opened the session by telling Facebook’s diversity story. “When I joined Facebook, I didn’t believe. Everyone in leadership was a white male—nothing against white males, but no one looked like me.” Today, Facebook trains employees about unconscious bias and creates programs that promote inclusion—emphasizing longevity in diversity, not just recruitment. After sharing Facebook’s story, Conneely talked about her own challenges. Conneely was six months pregnant at the summit and says the pregnancy was a surprise. “For a strategic planner like me, this was no bueno.” The stress she has endured, she says, reminds her of Latinos’ perseverance. “We’re the underdogs, and that makes us fight harder,” she adds. 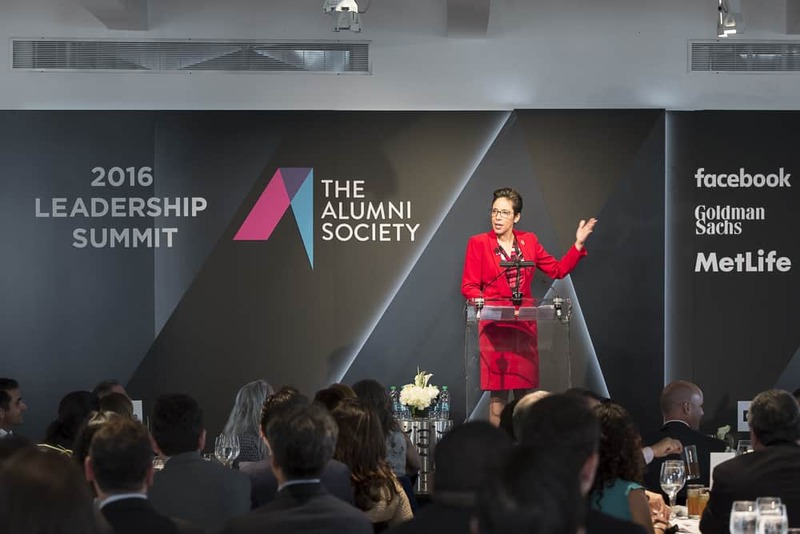 Society cofounder Ricardo Anzaldua, EVP and general counsel at MetLife, welcomed members to the second summit, which seeks to connect members and honor the class of 2016, featured in The Alumni Society magazine. He reflected on the origins of the Society. In 2013, Hispanic Executive magazine named Anzaldua one of its Top Ten Lideres and invited him to a luncheon, where he met publisher Pedro Guerrero, chief executive officer of Guerrero Howe Media. When Anzaldua shared his dream to create a network for Latinos who graduated from the top-ranked schools in America, Guerrero jumped on the idea. Three years later, The Alumni Society has hosted three events and has planned three more for 2016 alone. Regina Montoya, who serves on the Society’s advisory board and also on the board of DFW International Airport, gave the luncheon’s closing remarks. She shared The Alumni Society’s growth to nearly 800 members, a more than 300 percent increase since 2015. It’s still growing, she added, and she asked every person in the room to invite four colleagues to The Alumni Society.